on the road to Hana, a photo by Southworth Sailor on Flickr. 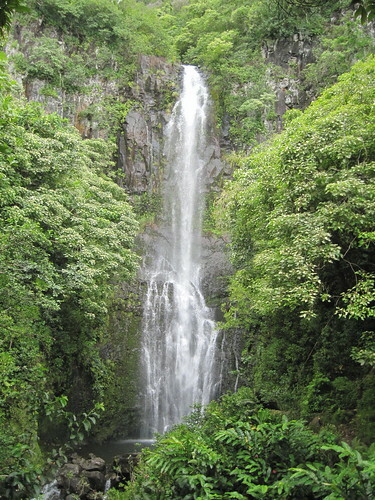 Every serious visitor to Maui is expected to take the 'road to Hana.' It is a windy (and windy) fifty miles skirting cliffs on the very wet Northeastern shore of the island. Lot's of traffic with one lane bridges to share with oncoming vehicles. True to form, during the whole trip we experienced different forms of drizzle. We stopped at a few waterfalls but didn't take any serious hikes. The weather didn't make the pools too enticing to enter; and the National Park made sure that we didn't enter the ones that did look inviting. After the long trip back to the dry side, we enjoyed the poolside sun at the condo for a couple of hours before sunset. Dinner was at a Hawaiian take out that had high recommendations.